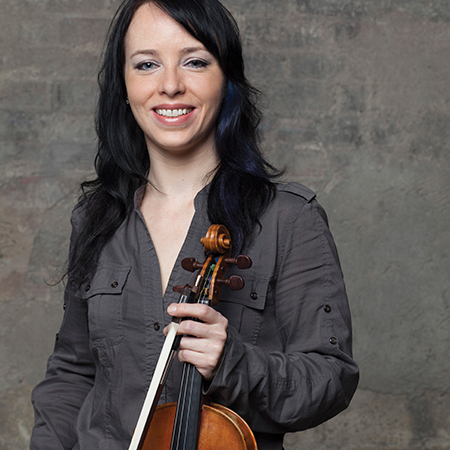 Jennie Press* began her violin studies at the age of three in St. John’s, NL. She made her solo debut with the Newfoundland Symphony at thirteen and has since had solo appearances with several symphonies and chamber orchestras in Canada and the United States. Ms. Press has been a national finalist numerous times in the Canadian Music Competitions, the Shean Strings Competiton and the National Music Festival, both as a soloist and as a chamber musician. She has also been a prize winner in numerous competitions including the Marbury Violin Competition, the Yale Gordon String Competition, the Alexandria Symphony Competiton and the Wellesly Symphony Competition. Jennie has performed in many symphony and chamber orchestras including the Baltimore Chamber Orchestra, Concert Artists of Baltimore Chamber Orchestra, Annapolis Symphony, Lancaster Symphony, and Key West Symphony, and has served as concertmaster in several orchestras including Royal Opera Canada, Annapolis Opera, Washington Summer Opera, De Camera Chamber Players, Peabody Symphony Orchestra and the Peabody Concert Orchestra. She has also performed with many pops orchestras which have led to performances in Hong Kong, at the Kennedy Center in Washington, DC, and at Carnegie Hall in New York. Ms. Press spent one year at the Walnut Hill School in Natick, MA as a student of Eric Rosenblith and was a member of the New England Conservatory Youth Philharmonic Orchestra which toured South America. She earned a Bachelor of Music degree and subsequently earned a Master of Music degree as a full scholarship recipient from the Peabody Conservatory in Baltimore, MD as a student of Victor Danchenko. She also spent one year as an Artist Diploma candidate under full scholarship at the Glenn Gould School in Toronto, ON as a student of Atis Bankas. Ms. Press has played in masterclasses and lessons for such internationally renowned artists as Midori, Pinchas Zukerman, Leon Fleisher, Donald Weilerstein, Camilla Wicks, Andreas Cardenes, Laurence Lesser, Lorand Fenyves, and members of the Juilliard, Orford and Vogler Quartets. Ms. Press is currently Second Assistant Concertmaster of the Vancouver Symphony Orchestra and was a member of the first violin section of the now defunct CBC Radio Orchestra.